Chocolate glaze optional - I'm trying to decide if it is better with or without. In the midst of trying to finish 52 illustrations by next week (I have 11 more to go! 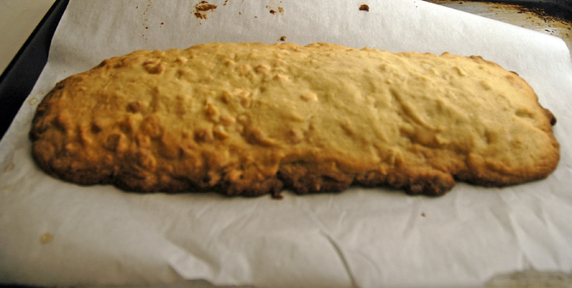 ), summer activities, preparing for September book events, I decided to honor my recent white chocolate fixation and attempt to create an original recipe of White Chocolate Macadamia Nut Biscotti. I’m traveling with my friend Kate the day before, who just released her book, Big Bouffant, and we are staying with her dear friend in Princeton who has generously offered us lodging. I decided to make this creation to bring to her. Hopefully she won’t mind the sloppy chocolate garnish I mistakenly put on the sides instead of the tops (see note below)! Stir flour, baking powder and salt in a bowl with a whisk. Set aside. In the bowl of a stand mixer, beat butter until fluffy, about 2 minutes. Add sugar and beat another minute. Add egg and extracts and beat until incorporated. 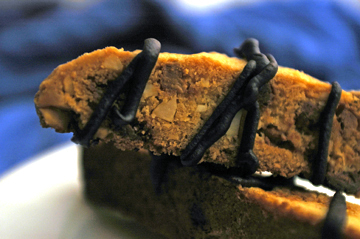 Stir in macadamia nuts and white chocolate until evenly distributed. Dump batter out onto a parchment lined baking sheet. 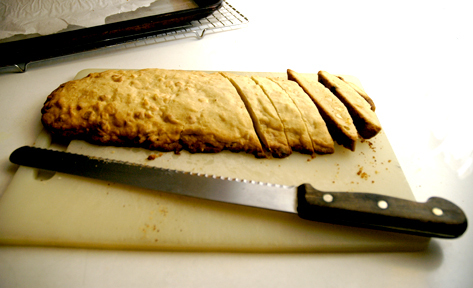 Wet hands and form dough into a large rectangular log, about 4-inches by 12-inches in size. Bake in oven for about 25 minutes until top is firm. Let rest on baking sheet on wire rack for 15 minutes. Lower oven temperature to 325 degrees. Carefully transfer log with two spatulas (it can easily break if it is not supported) to a cutting board. Cut log into diagonal slices about ½-inch thick with a serrated knife. Gently use a sawing motion, don’t press down too hard, or the log will break. Transfer the pieces back to the baking sheet and bake for another 20-25 minutes, flipping baking sheet and cookies halfway through. Remove baking sheet from oven and let rest on wire rack for about 10 minutes. 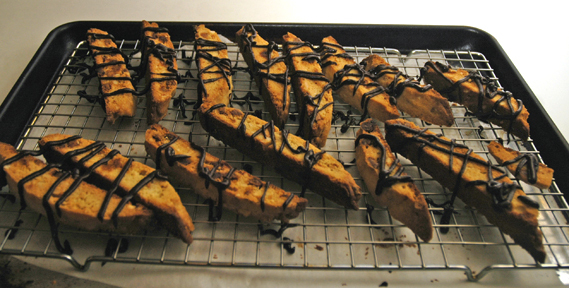 Then move biscotti to rack to cool completely. If you’d like to drizzle them with chocolate, just melt the chocolate in a microwave safe bowl at 30 second intervals (it took me about 90 seconds), stirring in between. Transfer melted chocolate to a sandwich Ziploc bag and press all the chocolate to one corner of the bag. Snip off a small bit of the corner so you have a tiny hole. 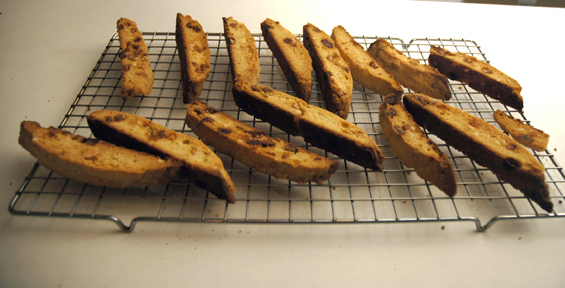 Turn biscotti so that the tops are up! (I forgot to do this – oops!) 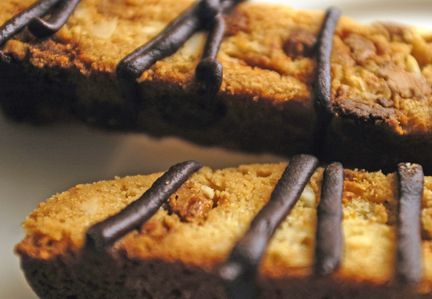 Squeeze the bag gently, drizzling chocolate over the biscotti. Major fail: I drizzled one side instead of the tops -- oops! To speed up the hardening process, you can chill in the refrigerator or freezer for a bit.